The year is 2120: Earthlings have spread beyond their galaxy and have started to colonize uninhabited planets in different solar systems. One such planet to be colonized was the Earth-like planet Gloria which happened to have an enormous natural supply of gold. This discovery became pivotal to Gloria’s emigration, so much that emigrators would be impoverished by the cost of reaching the planet. Because of this, life on the planet thrived in a setting similar to the American Old West. Though poor, the gold trade aided the Glorian’s in advancing technology and knowledge, so much that among the inhabitants lived talented inventors and engineers. However, the Glorian’s were not the only ones who were tempted by the planet’s gold: Space pirates known as the Wild Lizards quickly invade Gloria and decimate the towns of the people and enslave those who survived in an attempt to deplete the planet’s gold supply. Two inventors of Gloria who were a part of the planet’s development teams decide to strike back at their invaders using two fighter jets in the shape of giant revolvers with plane wings. As far as vertical scrolling shooters go, Gun Frontier is very standard. Players start with dual machine guns which are strengthened and multiplied by upgrades that come in the shape of US dimes taken from buffalo shaped enemies and every five dimes empowers the ship’s guns. Players also start with a bomb supply which is upgraded to further destruction by collecting gold bars from destroyed ground forces. Once a player accumulates 25 bombs, they are granted access to the Bomber Max, the strongest of the player’s bombs. The players can also pick up spinning coins with two different sides: a silver side and a gold side. If the player collects the coin on the silver side, then the player merely gains another coin for their guns. However, if the player collects the coin on the gold side, then the player’s guns and bomb supply is maximized to full power. A unique feature to the player’s bombs is that the direction of the bomb’s blast can be determined by the player’s movement. 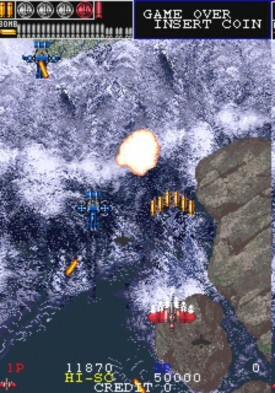 If the player moves their plane to the lower right of the screen and launches their bombs, then the direction the bomb will travel in the opposite direction the plane’s movement. This feature can only be used however when a player has a large bomb count as only having one or two bombs will result in a small directionless explosion. Like most bombs in shoot ’em ups, the bombs also work as a shield against enemy fire. The game uses a check-point system in which a downed single player will start off at the beginning of the check-point they died at. Gun Frontier also employs an anti-autofire mechanism where the difficulty will max out by the second stage if the player is sustaining too fast of a fire rate.